In 2008, a year after F1 Colours first launched, I ran down a list of my 25 favourite liveries from the beginning of the sponsorship era up to the beginning of the site’s life. Although a controversial list in places, and although I might have written it slightly differently if I were to do it all over again, it’s still broadly reflective of my taste in car designs. But what it omits, of course, are the liveries that have been designed since F1C launched. And so I thought it was about time to take stock of the last eight years of liveries, and come up with a list of my favourite ten since the site began. Once again, this is a strictly personal choice, and shouldn’t be taken as an attempt to come up with an authoritative “best” – and I welcome any and all debate in the comments! F1 Colours began just as the era of tobacco sponsorship in F1 was finally coming to an end – and some would say that this could be considered a contributing factor in the often unimaginative use of livery design in those years since. It’s hardly coincidence, either, that what I think is the best Ferrari of these years is indeed the last one to feature the Marlboro logo – although it only did so for a handful of races, as most circuits were in countries that had already banned cigarette advertising. While I still think Ferraris look best in a darker red and with black wings, I did prefer this striking all-red effort to the white-winged cars that have dominated in the years since. Mercedes have never quite hit on a perfect version of their livery – every time they improve it in one area, it seems they mess up somewhere else – but I think the best attempt was their second one. Removing the black accents of the 2010 car in favour of increased turquoise for Petronas, it made the best of a combination of colours that shouldn’t really work, but somehow does. I still wish the turqoise patch covered the entire sidepod, but it’s a minor complaint. This, too, was a car that still had the classic ’50s-style white circles on which to put the race numbers – a baffling omission on the most recent cars. Ah, loveable Super Aguri. Their red and white colour schemes were functional throughout their short life, but they got better with each successive year – and their last car was definitely the best, introducing black as a strong third colour. It’s only a shame that it was only actually ever seen at four races, before the team’s sudden winding-up. Look, let’s not go into the politics of it all for now. I still think it’s mad that Renault chose to rebrand themselves in this way, particularly when there was another team using the Lotus name on the grid. And it still would have been a heck of a lot better without the red wing endplates. But there’s no denying that this car looked absolutely terrific on the track – which makes it all the more baffling that they continued to tinker with it in successive years, until by 2013 it barely resembled any kind of JPS homage. Yes, it would have been much better if they’d actually managed to find sponsors to fill those “YOUR LOGO HERE” boxes. Running the whole season without doing so did make them look rather sad and pathetic. But with or without that unique marketing angle (truth be told, more with it than without it) this was a striking and memorable livery for a team that were badly in need of the kind of attention such a good design brings. 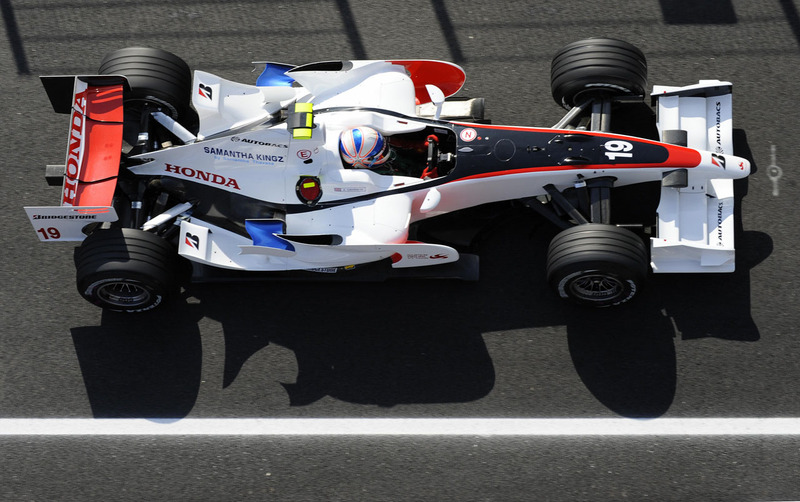 In any other year, the first Virgin (pre-Marussia) car would have been easily the best-looking on the grid. An excellent combination of red and black, with white trim, it looked like something Dennis the Menace would drive – well, with the exception of that floral pattern (maybe Walter the Softy got his hands on it). Successive Marussia cars weakened the overall look of the livery, but could never quite shake off the brilliance of the colour combination. I know that a lot of the love for the Martini Williams is more about what it represents than what it actually is. And I know that there are at least ten concept liveries made by fans that would have looked even better. But this is still a phenomenal livery, from a time when the sport really needed one. It’s a long time since Williams did anything that could be remotely construed as “flashy” – and this managed to do that while also showing an admirable amount of simple class and restraint. At the end of the day, it’s a car with proper racing stripes on it – how can you not love that? Renault were a running joke on this site for the first few years I was running it, thanks to the spectacular awfulness of their ING-based liveries. So it was refreshing to see that not only did they pull an absolute humdinger out of the bag for 2010 – but that also, with the exception of those blasted Total wing bits, it was exactly the design everyone wanted them to. The effect was muted a little bit once HP were added to the engine cover and the bumblebee-esque stripes were hence phased out, but this was still an absolutely superb car. Indeed, I think a lot of my hostility towards the 2011 Renaultus is as much based on losing this after just one season as anything else. Well, this can’t really be any kind of surprise to anyone who’s been reading the site for any length of time (and certainly not to those who saw my reaction to it when it first came out). Ignore the fact that they shouldn’t really have had the name. Ignore the fact that it now represents a rather sad, short-lived, ill-fated F1 enterprise that symbolised bad management and ended in ignominy. Ignore the fact that the car itself is a boxy, ugly shitbox that looks as slow as it actually turned out to be. And instead simply rejoice in the fact that it’s a metallic green car with a big yellow racing stripe down the nose. It’s not just the best livery that’s been announced since I was running the site – it’s one of the best since I’ve been watching F1 full stop. Do another one with these ones before F1 Colours began! BTW, that was a good maintenance of your site because I was patient at that time. Congratulations! The site looks great, this is the first time I leave a reply here, but i’ve been a visitor for a while now. I agree with most of the top ten cars, but i’d take the Williams Martini out and bring the BMW F1.08 or the 2007 Mclaren. Love the Lotus Racing and the Virgin! Cheers from Argentina. Actually, it was only used three times. For their final race the livery changed again! Here is my take on the same time period. Hard to pick 10-1, but it is roughly ordered in my preference, best-ish being at the bottom! Controversial indeed! Love the fact that Virgin, Super Aguri, HRT and Lotus Racing are all in your top ten! I’ve tried to put my top ten together but in general just how rubbish have the liveries been since 2007!? The only real class act is the 2013 Martini Williams. Food for thought for future features maybe, top 10 tobacco liveries, top ten alcohol, top ten tech/IT, top ten clothing/fashion. Not necessarily a title sponsor either?